It's not such a long time ago that the Club's membership could just about fit into the tea-room and the AGM occupied little more than the sofas in the first floor library. We've grown though. And not by default either. A sustained and well- planned campaign over the years has resulted in SRMG becoming not just the largest railway modelling club in Wales, but one of the largest in the UK: a club with a secure future and plans on the horizon for bigger and better annual shows, special rolling-stock commissions and improved facilities for all. A very big thank you all who supported the recent Club stock-sales. They were very successful events which, when the vendors were paid, still raised £1600 for Club funds. As long as pricing can be agreed, we are hoping to have just one more before Christmas, a large N gauge event. Members will be e-mailed with an update should one become available before the next monthly report. The Club also has a sales stand at the forthcoming Swansea Bus Museum Annual Running Day on Sunday the 30th. October. Buses and coaches from across Wales, and even the West Country, are expected to be on display and FREE open-top double-decker trips to Limeslade will be available also [weather permitting]. Come along and support both the museum and your Club! Post code and address: Langdon Road East SA1 8DB Entry £5, u-16 free. The usual reminder to check out our website if you've not visited lately. You'll find a review of the recent Club show [with a very large collection of photographs], a review of the new DAPOL N gauge 'Schools' Class loco and some updates in the members' projects section. For new members particularly, if you would like to showcase your own modelling within the website, please do not hesitate to speak to Gwion Davies: he will bite your arm off! And, seriously, it would be good to have more variety on there. Following interest from the recent show, our membership now stands at 98. Recent recruits include Ian Stevenson, Rob Allender, Deng Han and Cyril Havard. Their photos will appear on the membership board shortly, and please all make a point of welcoming them to the club when you see them. With the club having grown so much in size, and so many members attending [particularly on Thursdays], it's doubly important to introduce yourselves to new members so that they do not feel left out. Some really good news here. In terms of general décor, the Club has remained pretty much unchanged since the developments after we first moved in. Some new carpeting has been added, and the odd wall removed, but otherwise it's still recognisable as it was. A good spruce and clean-up is required, not just to make the place cleaner, but also to give it some personality and a feeling of welcome. It just doesn't feel like Wales' premier club in any way at present. By the time that you read this, some of the redecorating work will have commenced. It doesn't end with paint however: rooms and corridors that need re- carpeting will be seen to; the gloomy and dysfunctional workshop will be cleaned out, plastered and made more fit-for-purpose; better lighting will be installed where required; the entrance area will be made to look more welcoming and inviting, with some sense of Club identity and pride being evident; strong consideration is being given to installing a wall-mounted flat-screen TV at an appropriate location [for DVD use, etc. ]; the scenic treatment around the perimeter of the test tracks will be finished and that area tidied-up also. A big job. But one which is hugely overdue. And one which will quite reasonably reflect our success and growth. Put simply, we don't just need, but deserve, a 'wow' factor, something which visitors will remember and we can enjoy. Because it is intended that these works will be completed as soon as possible, the work will be undertaken by outside contractors as well as club members. It is not expected that Club members will undertake any of this essential work for free however: the Committee agreed that labour will be reimbursed at a commercial rate in order that those involved are not disadvantaged in terms of their normal employment. We really hope that you all enjoy the finished product ! Many have commented that parking within FOYD is becoming increasingly more difficult on certain nights with other users often taking a chaotic approach to this issue. Attempts to organise the car park have been ongoing for a considerable time but progress has been slow. For the time being it will remain as is, but all are asked to park considerately. It is likely that, eventually, the approach will be for the spaces at the front of the building to be reserved for disabled badge holders only. In the meantime, please be patient ! An advance diary note for you all – A Christmas mince pie and club social night will be held on the 15th. December. Further information in due course. The Club's 2016 commission [Harry D Evans & Rogers] was extremely successful and, by the recent show, a complete sell-out, raising valuable funds. From this experience, we believe that there is a strong market for local coal traders' wagons and next year's commission has now been agreed by your Committee. Noel Blows is managing the development for the Club with the Welsh manufacturer, DAPOL. The 2017 commission is an exciting development: a pair of private-owner wagons, again featuring 'Coal in Swansea', which will see The Clyne Valley Colliery Co [in lead] and W Craven Llewelyn [in brown] being produced. Both of these local concerns will be available in three gauges and pricing, delivery dates and other details will be available in due course. We shall endeavour to release the OO and N gauge versions as twin-packs [but to be confirmed]. To give you an idea of what is being planned, photographs of two vintage models of these wagons [built from defunct kits] appear below, courtesy of long-standing club member John Rogers. 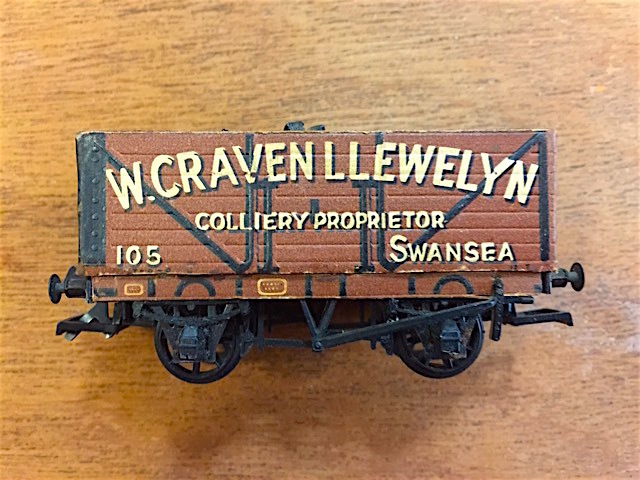 For modellers' information, the Craven Llewelyn model is an original wooden-shelled Peco 'Wonderful Wagon' and is possibly 60+ years old: a very scarce and collectable item now. certain to be sharp! As with this year's model, pricing for the pair will remain competitive. An update from last month's note. The vast majority of outstanding subscriptions have now been recovered and many thanks to all for co-operating with this. Unfortunately, this does tend to be a recurring theme however and to ensure fairness to those who do pay promptly, the Committee has decided that with immediate effect, subscription arrears in excess of three months will result in termination of membership. According to the Museum, 3,600 through the doors ! An extremely successful event and many, many thanks to Ted Hylton and his team for managing this event so professionally. The positive feedback received from traders and the public was overwhelming and the Club was able to make a profit from the event also. A write- up can be found in the Club's website together with a large file of photographs taken throughout the two days. Have a look. Planning is already well underway for next year's show at its new venue, the Leisure Centre, just 25 yards from this year's event ! David Lane is managing the planning team and a number of traders and exhibitors have already indicated their attendance. The dates are the 7th. and 8th. October 2017 and you will receive regular updates as more becomes known. The 2017 event is also the first exhibition that the Club will have to both pay for the premises and also cover accommodation costs for visiting exhibitors: consequently, as with the majority of exhibitions, there will need to be an admission fee to ensure that all of the running costs are met. The entry fee will be competitive – we want people to attend ! - but it will also be necessary. Watch this space ! Advance notice that our annual general meeting will take place in the first floor chapel on the 24th. November at 7.00pm. An agenda will be prepared by the Secretary in due course and a copy of the minutes of last year's AGM [circulated to all last year] is available for view on the notice-board adjacent to the signing-in book. The three ordinary members of the Committee – Scott Rhodes, John Allnutt and Nick Kerslake – have indicated that they wish to remain in post. If any member wishes to stand for any of the Committee positions, the current Secretary [Ted Hylton] will need to be advised no later than 8.00pm on the 17th. November 2016, together with details of their nominating and seconding members. In the event of an election being necessary, this will take place through show of hands at the AGM.